The Strong Box, close-up locked box . 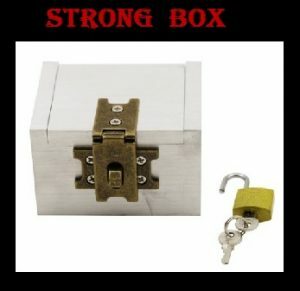 which allows you to load a solid metal box with anything that will fit inside – while it is sealed with an ordinary padlock!. Perfect for magicians, mentalists etc. Effect: A steel box is slammed shut and secured with a padlock. A spectator pulls, shakes, prods, yanks, heaves, jerks on the lock…but it doesn’t budge. The exhausted spectator hands the box back to the magician. With no sleight of hand, without even a twitch of the muscles, the magician effortlessly opens the lid, exposing whatever treasure awaits inside. What You Get: silver box, lock, key, and instructions.